I just can't seem to quit the apple! It's just too good of a flavor to give up, and this Apple Pomegranate Fizz might just be the perfect fall cocktail. We were asked to give it a try as part of the West Elm and Whole Food collaboration a few weeks ago, and it's a recipe we keep coming back to. Cocktail-ing for a good cause? We are always down for that! We still have a ton of apples leftover from our trip to the apple orchards a few weeks ago, and this seemed like the perfect recipe to try from the collaboration - although all of them looked quite yummy! The second time around we made this cocktail, I adjusted it to make it a little bit simpler. Here's my twist on the Apple Pomegranate Fizz. 1: Mix 1/2 cup of hot water, sugar, and ginger beer. Mix until sugar is dissolved. 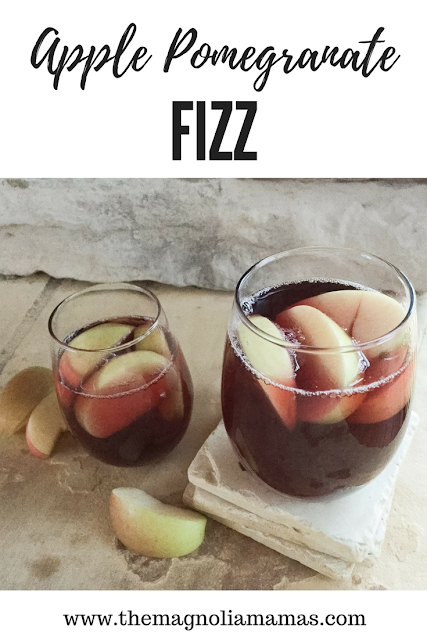 2: Stir in sparkling cider and pomegranate juice. 3: Place mixture in large serving pitcher or punch bowl and garnish. Whether you are celebrating the end of season tailgates, or have a holiday party on the horizon, the Apple Pomengrante Fizz would be the perfect drink to serve your guests. Now please invite us so we can enjoy it again too!